Here are all of the webrings I belong to! This Web Guard site is owned by SweetiePie. Here are the figure skating webrings I belong to! 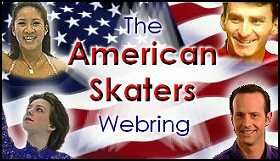 This American Skaters site owned by SweetiePie. WebRing maintained by Glory On Ice. Graphics by Diane. Click here to go back to SweetiePies main page! Go back to SweetiePies Ice Skating Heaven!